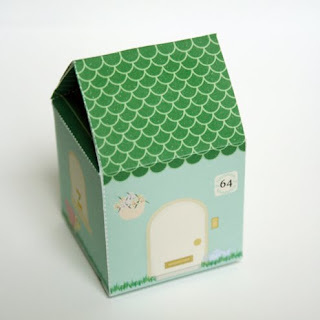 Yes, that's right, a teeny paper model of Turtle's house. It also doubles up as a cute little gift box, just big enough for a few chocolates or a couple of tea bags. Turtle sits his on the antique bureau that his great aunt left him, it houses some rather tasty jelly beans and acts as a handy little paper weight. So if you fancy making Turtle's scaled-down abode, just click on the picture above to download the template. You will need a pdf viewer such as Adobe Reader to print the page. If you don't have it already you can download it quick sharp for free here. Turtle suggests printing the template onto A4 white card for the best results, or some thick white paper if you don't have card. Turtle also asks that you're very careful whilst cutting out the template, no injuring any hands or fingers please. Anyway, Turtle hopes that you enjoy his house as much as he does. Turtle wants to see your photos! Done something interesting with Turtle's house, taken an arty photo of it, or just feel quite pleased with your construct? Send your photos to Turtle. Turtle, you're very generous to share your gorgeous wee home - Quernus is thinking about making a Wee Turtle to live inside this home - pictures to follow!